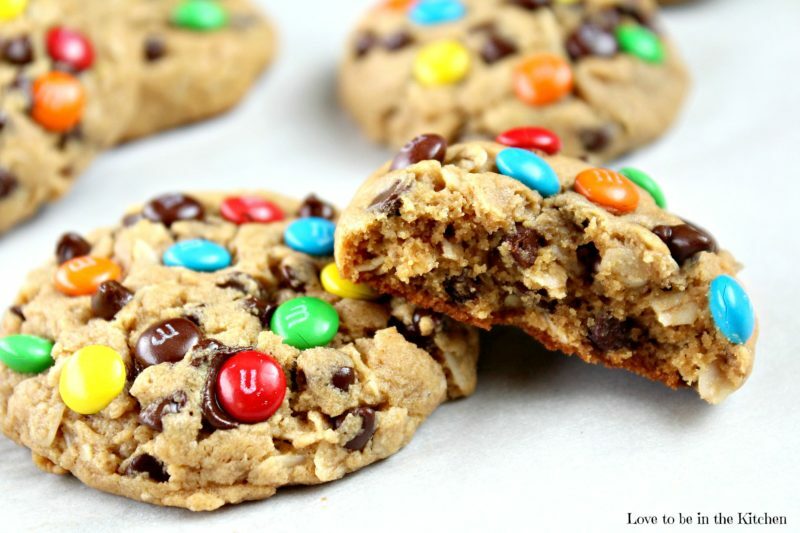 A soft and delicious healthier Monster Cookie made with peanut butter, oats, mini chocolate chips and topped with colorful mini M&M’s. There’s no butter, oil or flour in these cookies! There’s nothing I love more than a good cookie! You all might know that my absolute favorite cookie is a good chocolate chip cookie. My kids love cookies too and so I was thinking about how I should come up with a healthier cookie option both my kids and I would enjoy. 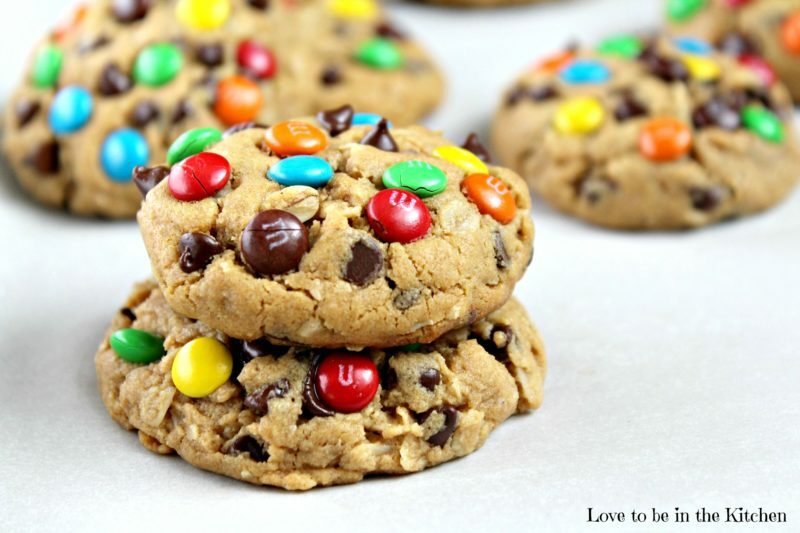 I adapted my favorite healthy peanut butter cookie and changed a few things such as adding M&M’s since my kids LOVE M&M’s! I was thrilled how pretty they turned out and even more excited when my kids really enjoyed them! They didn’t even notice at all that these are healthy. No butter, no oil and no flour! Hardly any sugar added but still perfectly sweet with the addition of a touch of honey. We just moved and my son had his first day of school on Monday. I was more nervous than him hoping he would like it since he was so happy at his old school. After school, I had these cookie waiting for him and he was so happy! And btw he is enjoying his new school. Thank goodness! I love how quick these cookies are to make! It’s a one-bowl recipe! Just mix together your ingredients, scoop, and bake! Let cool then enjoy one of the best cookies ever! 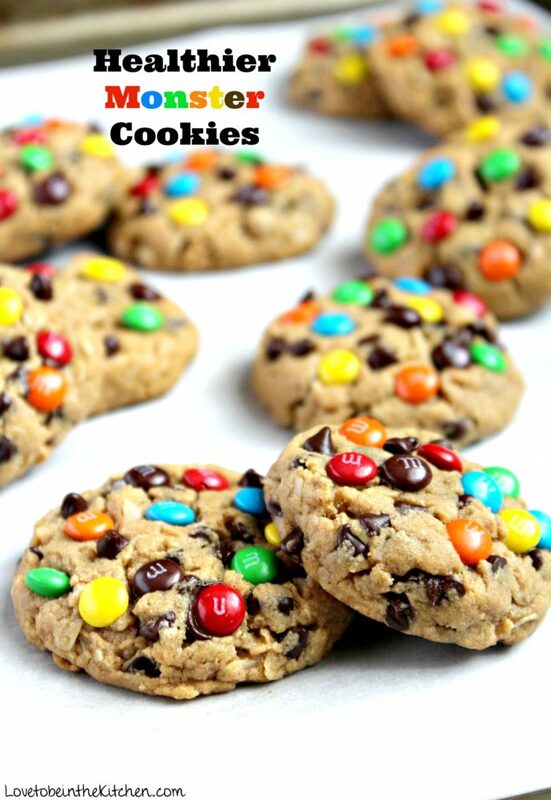 These cookies are awesome and I know you will love it! My kids always get excited when I make this cookie recipe. They are big fans of M&M’s. The vibrant colors really make these cookies pretty and tasty looking! And I love that I know they are eating a healthier dessert recipe. In a medium-sized bowl (I used my stand mixer) stir together the peanut butter, honey, and brown sugar. Do not warm up the peanut butter or the honey. Add the oats, salt, baking soda, and vanilla extract. Stir well. In a separate bowl lightly beat the egg and then add it to the mixture. Use a cookie scoop to scoop out the dough. Press the dough very tightly in the cookie scoop to form the balls if using your hands squeeze the mixture tightly into a ball so it doesn’t crumble. Form the balls onto a cookie sheet, press down slightly, top with the M&M's and more mini chocolate chips if desired and bake for 7-8 minutes. Watch the cookies closely and remove when the bottom barely starts to brown even if they don't look completely done (they cook more as they cool). Those look really yummy, even without all the bad stuff! I can’t wait to try them! Those look delicious! I’m definitely going to have to give them a shot 🙂 Do you think I could sub regular chocolate chips for the M&Ms? These look tasty! I have a question about the m&m’s. Are these the baking ones you find by the chocolate chips? Or the regular mini ones that you find with other candy. Thanks! Thanks! 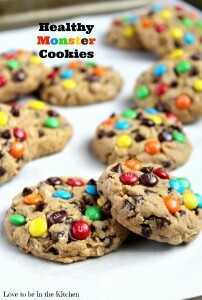 I used regular mini M&M’s but I’m sure the baking ones would work just as well too! Those look delicious and I am sure that my kids would LOVE this! Thanks for the recipe! Thanks! My kids really enjoyed it! These look incredible- pinned for later! Thank you! for the old fashioned oats do they need to be processed into an oat flour or baked as is? Nope. But you can blend them into a flour if you want. If you do that measure out the oat flour to be 1/2 a cup. Can I use regular sugar instead of brown sugar if I dont have any? Yes, that should be fine. Brown sugar is preferred because of the flavor and chewiness it adds though. what could we sub out for the brown sugar?? would apple sauce work?? or more honey? Honestly, I’m not sure but I think either more honey or applesauce would work. I’d say about 2-3 tablespoons. Please let me know what you try and if it worked! I’m going to try using date sugar and a flax egg and see how that turns out. I’m completely obsessed with these!!!!!! Want to try these cookies but am counting my calories..do you know how many calories 1 cookie is? Did you find any calorie info on these? I am so happy to hear that! Thanks for letting me know. 🙂 These cookies are pretty amazing! Wow, these look great. Can’t believe there’s no oil, butter or flour in them! Pinning these to make soon. These are soo tasty!! Made them last night for the first time. At first I thought I had burned them because the bottoms were a bit dark, but thankfully they don’t taste burnt at all and the tops are so soft and delicious! This recipe is perfect for peanut butter lovers. Thanks for sharing! Thanks for letting me know Sarah! 🙂 I’m so glad you liked these. I’m not sure how long you baked it but try baking it for just 7 minutes next time. I’ve never had mine come out dark, just keep your eye on it! Oven temperatures can vary slightly plus the size of the cookie can affect baking time. Thanks for leaving a comment! I’ve tried a lot of healthier baking options on here and nothing lived up to par… Except these! They were totally delicious! Thanks! Thanks! You could try another nut butter like almond. Wow, these cookies are really good! I was having a craving for Monster Cookies like I made when I was kid, but was trying to find a healthier version. These are great. Nice peanut butter taste and with the chocolate chips and M & M’s…Oh my goodness. I will definitely make these again! Thanks for sharing! So yummy!! How many calories do you think are in each cookie?? Thanks Alyson! Sorry, I don’t have that information but I’m sure there are a lot of calorie calculators out there that can help you. For those that want to know, I did a calorie calculator and found its about 163 calories per cookie (if you make 16 like the recipe says).